The first in my new series of video game console mosaics - say hello to the Sega Master System II. 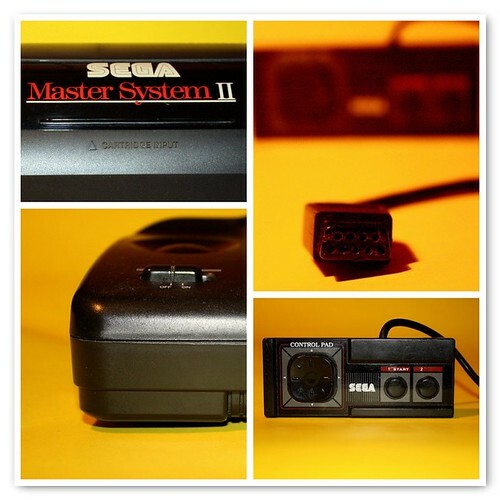 "The Master System II was released in 1990 and was popular in Europe and Brazil. It is smaller and sleeker than the original Master System, but in order to keep production costs low, it lacks the reset button, composite video and card slot. All consoles included a game that plays when no cartridge is inserted. The built-in game was originally Alex Kidd in Miracle World, which was switched to Sonic the Hedgehog on later PAL consoles. Sega marketed the Master System II heavily; nevertheless, the unit sold poorly in North America. By 1992, the Master System's sales were virtually nonexistent in North America and eventually ceased.